Select pictures, yearbooks, publications, and other material from the College Archives are already being made available online. There is more to come, so visit again soon! The Crown College Archives are curated and maintained by the library. Containing books, theses, tapes, institution publications, photographs, records, realia, and more, the College Archives provide a wealth of information about the 100 year history of Crown College. The 2016-17 will be a year of celebrating the centennial of Crown College! Check out the main webpage as well as the timeline for additional photos and facts from the Archives! Beginning 1916 by Rev. J.D. Williams, Crown started with just a few students. Of course at that time, it wasn't yet named Crown College. 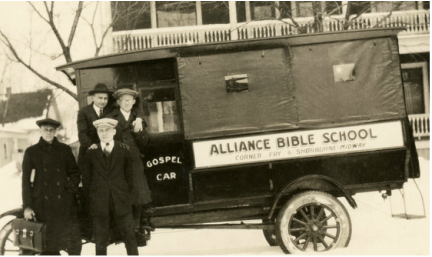 The school began as Alliance Training Home and was later changed to St. Paul Bible College (with a few more name changes between!). It wasn't until 1992 that the name became Crown College. In 1917 the very first campus was built on Sherburne Avenue in St. Paul. It still stands today. A move was made in 1935 to the second campus on Englewood Avenue, also in St. Paul. The only building of this campus still there today is the library. In the 1960's, a third campus was pursued. Land was purchased in Arden Hills with the hope that a brand new campus could be constructed there. That was not to be, however, and a 10 year old Jesuit College in St. Bonifacius became available. (See original construction pictures here.) The final campus of Crown College was purchased in 1969 and the move was made in 1970. Of course there is much more to Crown's history than campus locations. The music groups, athletic programs, Bible classes, and student activities are just a few of the topics that give Crown students and Alumni pride. There have also been 16 presidents, a multitude of favorite professors, curriculum changes, construction projects, and other changes. Collections about all of these topics are constantly being worked on to be added to the Archives site, so check back soon for more! Check out our featured automobile collection. Yearbooks are beginning to be scanned, starting with the first Crown yearbook from 1939. Check back soon for your yearbook! If you have any questions regarding the College Archives, please contact Deanna Munson at munsond@crown.edu.